A spring arm , press knob, contact stud and a connecting stripwith two 4 mm. terminals onplastic base of 100 x 60 mm. size. A contact arm and three metal studs mounted on a bakelite base with three brass terminals. The centre terminal is common connection to the arm and the two other terminals are connected to the other studs. 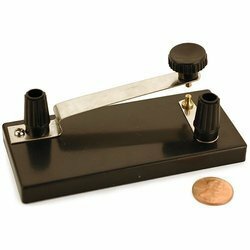 In order to keep pace with the never ending demands of customers, we are involved into offering wide range of Contact Key Single . 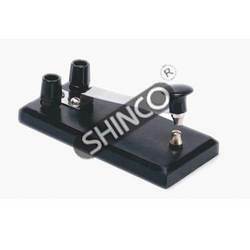 With our expertise and trustworthiness, we provide an optimum quality of Contact Key Double. The well degisned device but basic construction mounted on a bakelite base, comprising two connecting strips, two plated srping arms with press knobs, two contact studs and four brass terminals connected. Also available in single contact. In order to meet excellent quality standards, we are supplying Contact Key. We have gained huge accolades by our clients for our excellent quality range of 1994 Contact Key. These are manufactured using superior quality materials, procured from reliable vendor and find a wide application across various industries. We are a top-notch organization, engaged in providing Contact Key. A brass C.P. spring arm with press knob & two brass terminals. All mounted on bakelite base 80x55mm approx. A brass C.P. Spring arm with press knob and two brass terminals. All mounted on bakelite base 80x55mm. We are engaged in offering Contact Key. We are a top notch supplier of Contact Key. Banking on our enriched industry experience, we are able to supply Contact Key. Burettes with Single Bore Teflon key(Rotaflow) , Accuracy as per Class B. Tapping Key (Single Contact) "PICOASI" Cat. No. 30 - Brass Strip (Nickel Plated) with insulated knob and terminals mounted on a bakelite plate of high insulation.